Despite hundreds of posts and campaigns against bullying, bullying is widespread and crushes the mind of early career researchers. So why do we ‘talk the talk but do not walk the walk’ against bullying? I don’t know about you but after seeing so many campaigns against bullying and harassment in the workplace I feel that the problem should have been solved by now. In my mind, if bullying were like measles, then anti-bullying campaigns would be the vaccines, ready to eradicate the issue. But I was wrong. Vaccines work against measles; anti-bullying campaigns seem to be the placebo. Bullying is everywhere, but still many taboos exist that preclude us to accept and act on the perpetrators of this behaviour. My aim with this post is not to be another anti-bullying campaign, or to urge for bullying to stop (although I do urge it to stop!). These kind of texts don’t work – people don’t empathise until it happens to them. So instead, I would like to share my personal view of what bullying is, why we fail to accept and act when bullying happens, and how soul-crushing it can be and has been for me. How many shades of bullying do we put up with? Bullying and harassment can be subtle – so subtle that you only realise when ‘you are in too deep’. Some may argue that different people will experience the same situation differently, and therefore bullying is a subjective term. I agree – we all have different perceptions of our situations and react in very different ways. But we can all agree that there is a clear threshold separating what is acceptable and what is not (Figure). I think I reached this threshold when I was physically intimidated by my supervisor in a meeting during my first postdoc appointment. And this is just the tip of the iceberg – there were all of the old-school bullying techniques of demeaning jokes, patronising comments, and humiliation that are opened for interpretations. But let’s face it, when someone stands up from the table and leans towards you aggressively while intimidating you physically, the line is quite clear. So, it is time for us to accept that there are not ‘fifty shades of’ bullying and harassment. Bullying exists and will continue to exist unless we stop trying to cover it up with social lies like someone ‘being too sensitive’ or ‘lacking emotional control’. Let’s own it! Newton’s third law of motion states that for every action there is an equal and opposite reaction. With bullying though, there is no opposite reaction. This is because bullying often involves differences in hierarchy that – in academia especially – seriously prevent reactions. It is like standing in the ring with your hands and legs tied, about to fight Mike Tyson. Bullying and harassment was crippling to me. I am a reasonably confident person and scientist, but was knocked down by the constant insults and embarrassments that I put up with on a daily (if not hourly) basis. But the problem is that, when you are being bullied, you take up all those insecurities projected onto you by your perpetrator and start believing them. Then, in a sinister and unconscious way, the bullying becomes acceptable to you because, after all, you convinced yourself that “you are a loser” and “you are useless and can’t do anything right”. From there, my friends, it was a downhill journey for me, and the destination was depression and self-loathing (Figure 1). I hated myself. I thought I was a loser. I was convinced that everything I was doing was wrong. Feedback? Sounded like personal attacks in my ears. Bullying had destroyed my self-esteem and confidence and on the way, crushed my creativity and aspirations for my future in science. Stop complaining. If it is that bad, why don’t you quit? As I mentioned, bullying is silent and, at some point, acceptable to you. Why would you quit a job that you believe you are the problem? There was the income problem. Why would I quit my job and be unemployed? I was already struggling with self-esteem; can you imagine what the added strain of being unemployed would have had on my psychological state? The early career publication madness. As an Early Career Researcher (ECR), funding agencies and other researchers seem to reward publication (‘the publish or perish’ culture, which is a whole other issue for a future post!). I had a paper that needed to be published or my CV would perish. The problem was that I did not trust my supervisor to keep my name in the publication if I resigned. If that happened, how could I fight for authorship? How could I claim authorship for something that had been published? How would an ECR fight with a Professor over publication? You see, I was paranoid (although not without my reasons), and that’s a side-effect of bullying. Other personal issues – after all, I still had a life with other commitments. In that sense, quitting was not as straightforward as it may have seemed for an outsider. And that is what most people do not realise – sometimes, there are constraints in other people’s lives that you cannot see. If someone stays in a job while experiencing harassment and bullying, don’t blame them! Don’t blame the victim. After all, why should the perpetrators enjoy the relaxing comfort of their position while the victim is the one stressing out to find a new job? I resigned after 6 months in the job. It was hard to resign from a three-year contract (potentially five years, as we were getting investments). The stress of the uncertainty just piled up on my already-fragile emotional state. But the bullying was just too much for me. Yet, despite resigning, the bullying and harassment had long-lasting effects on my mental health. It took me well over a year to come back to my usual way of living and working. My new job environment, my colleagues, friends and family really helped throughout the healing process, and I am really grateful to all of those that supported me during my recovery. But see, not all of us are lucky to find places that allow us to heal, and many give up on their careers in science altogether as a result of bullying. 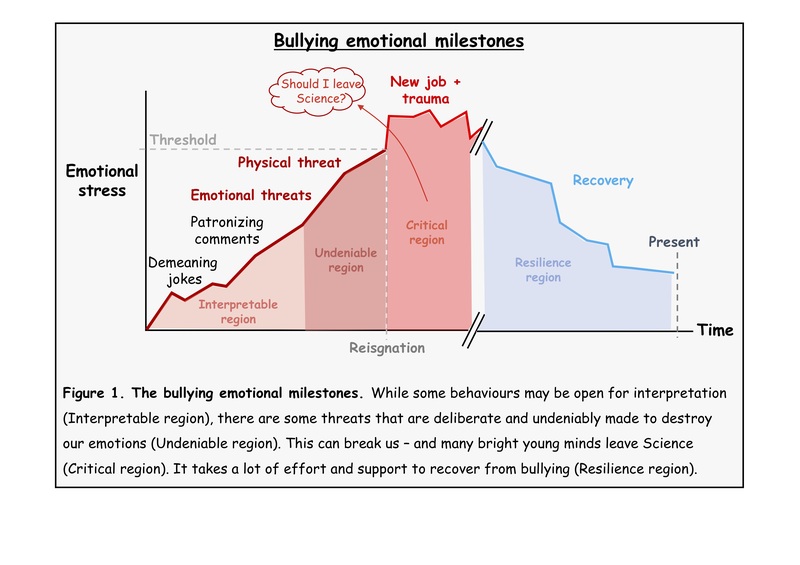 How many scientific breakthroughs are we wasting because of bullying? How many brilliant minds are crushed with such a terrible emotional abuse in the workplace? Meanwhile, the perpetrators continue to flourish – and it gets harder and harder to take them down as they go up the academic ladder and gain more influence in the field. And I think this is a problem with the academic system – I guess it is easier to let go of a postdoc than to own the mistake of hiring an unethical (and very expensive) Professor. Note that, in this post, I shared how bullying affected my health and wellbeing. But bullying goes beyond that – it affected my loved ones too. That is because bullying is a ‘holistic’ experience. While the details of how bullying affected my personal relationships will be the content of future posts, my question is ‘why so many people have to pay for the unethical behaviour of a bully?’ Let’s face it – bullying is a community issue and must be treated as such. The fact that I am scared of the consequences for even publishing this text – despite the fact that it happened years ago – just shows how deeply problematic our culture is. Those that experience bullying don’t speak up because we are afraid of retaliation. It is time for us to seriously think about how we are treating our (young) scientists, and create better environments that foster creativity and independence. As for the experience I shared, I will leave it up to you to decide how detrimental to Science the problem of bullying really is. Sucrose and starch intake contribute to reduced alveolar bone height in a rodent model of naturally occurring periodontitis. Morimoto J, Senior A, Ruiz K, Wali JA, Pulpitel T et al. Eberhard J (2019) PLoS One 14(3):e0212796. Thanks for sharing this very personal story, Juliano. Thanks again for being so honest about your experience!